This simple and safe plug and play tuner allows for increased horsepower and torque through 4 preloaded performance tunes, Economy, Towing, Daily Driving and Extreme Tuning. In addition to the new slim case design, the F5 Flashpaq upgraded to a 2.8” full-color high resolution display and a new easy to use graphic interface. Superchips Flashpaq features a host of advanced features like the ability to read and clear trouble codes, speedometer correction, adjust shift firmness, adjust speed and rev limiters, and even control active fuel management on some models. 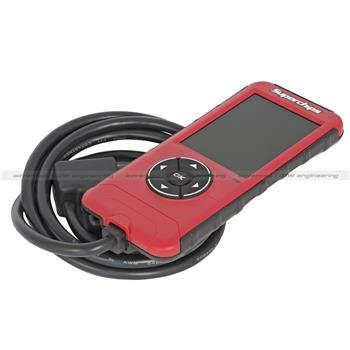 Note: This Superchips Flashpaq is CARB exempt for select gasoline models for sale in California on vehicles registered with the California Department of Motor Vehicles. For a complete list of CARB approved vehicles review E.O. #D-330-15 on the California Air Resources Board Web Site.